Japan is very well-known for their minimalist style and their practical, no-nonsense approach to design. While the rest of the world caught on to minimalist during the 60’s, the Japanese have practiced using the bare minimum to achieve practical and aesthetic results long before that. Japanese architecture was heavily influenced by their Chinese neighbors, and by their religion, a naturalist faith called Shinto (神道). Shinto is a collection of native mythologies and spiritual beliefs that encompass the daily lives of the Japanese. In Shinto, adherents believe that spirits known as kami dwell in everyday objects, things, and natural features. This is reflected in their architecture, which seeks to incorporate as much of the natural world into its buildings. To do this, Japanese architecture relies heavily on the use of wood. Stones are rarely used, unless it’s for building foundations. Because they believe that the kami reside in the wood, it is treated very carefully before, during, and after construction. Traditional Japanese carpentry is legendary for its use of wood joints that require no glue or nails and can last longer than its European counterparts. Miyadaiku 宮大工 – Carpenters who specialize in building shrines and temples. Their use of highly complex and long-lasting wood joints that require no glue or nails is legendary, and the structures they build usually survive centuries of use. Sukiya-daiku 数奇屋大工 – Carpenters who specialize in building teahouses and other residential structures. Their discipline is well-known for using beautiful and fragile structures with the use of rustic and simple materials. Sashimono-shi 指し物師 – Carpenters who specialize in creating wooden furniture. Their use of a special wood-locking technique called the Hozo gives them a distinct appearance. Tateguya 建具屋 – Carpenters who specialize in constructing sliding doors, cabinets, walls, and other interior finishes. Although it is uncommon for sashimono-shi and Tateguya practitioners working on things outside of their discipline, some traditional workshops can operate as both a Miyadaiku and Sukiyaki-daiku. This rote separation of disciplines reflects Japan’s insistence on excellence, quality, and tradition, with each school of carpentry using very specific tools for their particular functions. 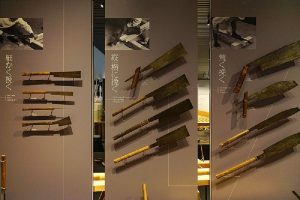 Gennoh 玄能 – Japan’s traditional version of the hammer, the gennoh family of tools features various types for various jobs, such as for chisel work and, in rare instances, driving nails. But even in driving nails, Japanese carpenters use a special technique that minimizes the damage done to the wood. When driving nails, the flat side of the gennoh is used. When the nail is almost completely embedded, the convex side of the hammer is used. Kanna 鉋 – The Japanese plane consists of a wooden block called the dai (台) which contains a securing pin, a laminated blade, and a sub-blade. The blade is commonly fixed in position, usually near the plane’s abutments on the side of the block. Unlike western planes, the Kanna features a convex support bed for its blade. The blade itself is made in such a way that it is wedged tightly into the block when tapped. They achieve this by tapering the blade’s thickness. A different type of plane, called the yarigana is used primarily for large, circular columns, and is built with a single piece of metal. Constructing the Kanna and the yarigana in this way gives carpenters a uniform rate of shaving. The Kanna also uses a pulling action rather than a pushing one, providing the carpenter with more power and control. Nokogiri 鋸 – Unlike its European counterpart, which cuts on the push stroke, the Japanese saw or Nokogiri cuts the wood on the pull stroke. This means that the Nokogiri can use thinner blades than a western saw, making it lighter and easier to control. The Nokogiri uses two types of teeth: crosscut (yokobiki) and rip (tatebiki). A combination of both teeth is called a ryoba, which means “dual edge”. 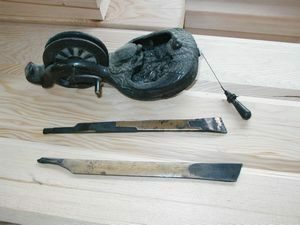 There are many more types of saws in Japanese carpentry, with each one performing a very specific task, like the azebiki, which is used for sawing in cramped and tight areas and for starting cuts on the middle of a surface. Again, unlike its western counterparts, every Japanese saw is hand-made and forged specifically for individual carpenters. Kiri 錐 – The Japanese version of a gimlet, the Kiri is used to bore circular holes in the wood and is most commonly used in the creation of a mortise. Many Japanese carpenters consider the Kiri as one of the most difficult tools to use, with Kiri masters being sought far and wide for projects. Nomi 鑿 – The Japanese version of the chisel comes in many variations to fulfill specific tasks. Much like the other tools, the Nomi is made with laminated hard or soft steel, depending on what it will be used for. Typically, the bevel angle of the Nomi is between 20˚ to 35˚, with heavy chisels having steeper angles. Because Japanese architecture features a lot of soft woods, paring chisels have a much shallower angle. Sumitsubo 墨壺 – A unique feature in Japanese carpentry, the sumitsubo is a special inkpot that’s used for marking straight lines on a surface. The sumitsubo comes with a thread called a tsuboito, which is tied to a rounded piece of wood. The thread has a needle called a karuko on one end, with the other end passed through a depression containing ink. The sumitsubo is able to create straight lines on any surface, regardless of texture or any irregularities. Japanese carpentry features many other unique tools and techniques. 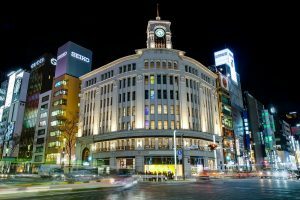 Indeed, their style of carpentry and architecture are worthy of respect and admiration, much like how Japanese carpenters respect and admire the influences of their craft.